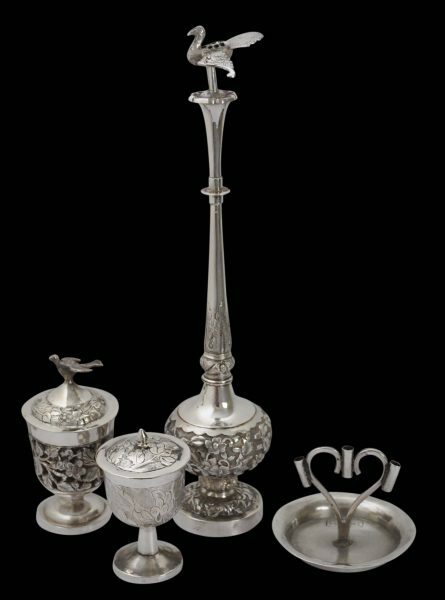 This set of four ritual implements has come from a Parsi family now located in the north of England and which originally is from Bombay, India. The set is of high-grade and almost pure silver. 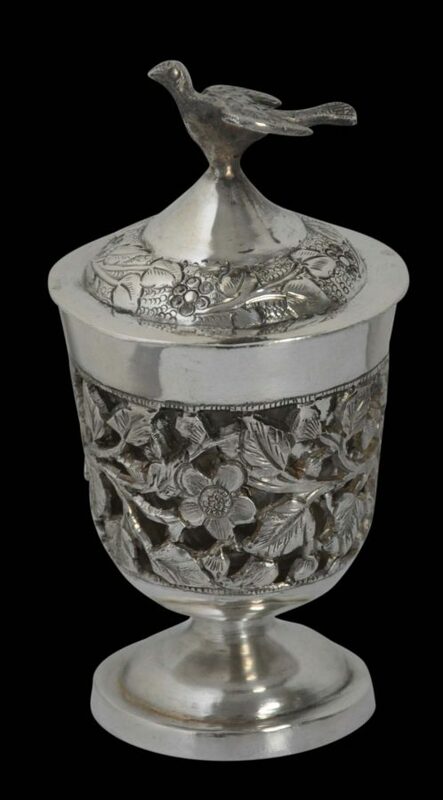 Such silver purity was required for items to be used for ritual purposes and is a characteristic shared with local religious Hindus in India. The four items comprise a rosewater sprinkler; a pierced covered stem cup with a hand-blown glass liner; another covered stem cup; and a small incense tray which can hold three incense sticks. 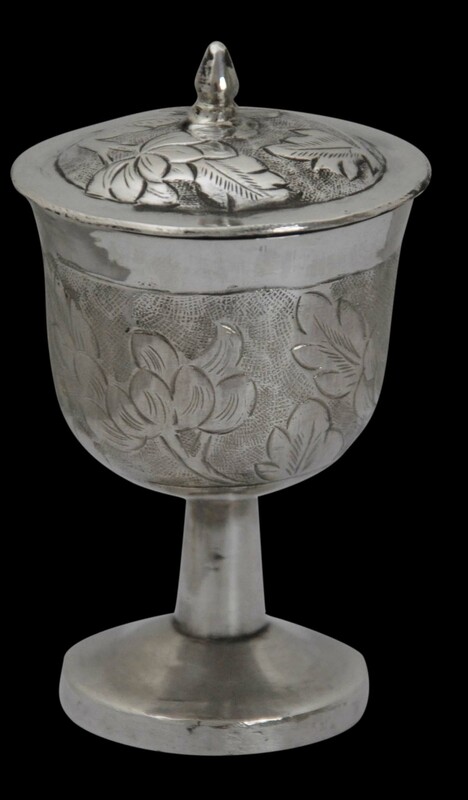 The pierced stem cup is stamped with ‘TM94’ as is the incense tray and the other pieces are without marks. The pieces show Chinese silversmithing influence and possibly were made in China for export to the Parsi community in India. Otherwise, they were made locally in India. The items are chased and engraved with floral and leaf motifs and the sprinkler and the pierced cup are topped with birds. 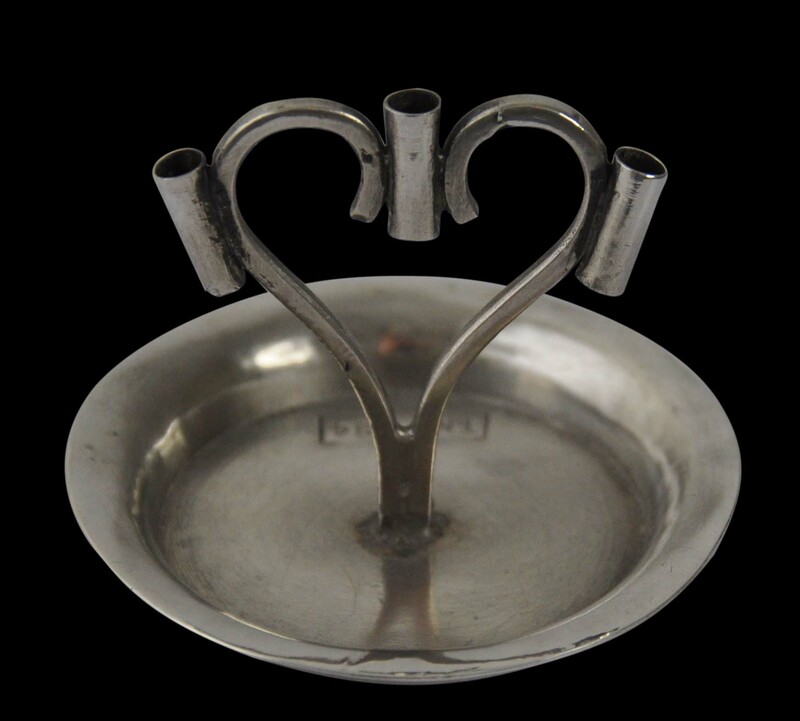 Such pieces were used along with other implements during Parsi ritual celebrations such as birthdays and navjote (coming-of-age) ceremonies. The sprinkler held rosewater to symbolise fragrance and happiness and the stem cups held vermillion powder and betel nut slithers also for ritual purposes. Each of the items is in excellent condition. Cama, S., ‘Parsi crafts: Gifts from Magi’, UNESCO Power of Creativity Magazine, Vol. 2, August 2008.